The OnPage Poller Setting is a redundancy option within the OnPage application, it will check for new messages in the background at a specified interval. 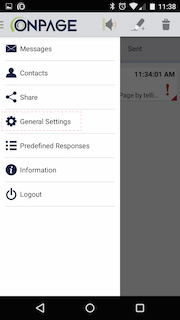 In the case that push delivery of messages is unavailable, messages will be retrieved via this polling feature. Please Note: To ensure timely delivery of messages a lower time interval is suggested. 1. 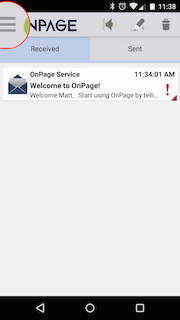 Select the Navigation Bar at the top left of the OnPage screen. 3. 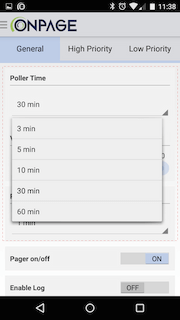 Press on the minute value listed beneath the Poller Time setting. 4. From the list of minute values select 3 minutes.